If you know me in real life, you know that I am, ahem, a heavy tea drinker. My brew of choice is Adaigo’s Ceylon Sonata. It’s like drinking English Breakfast on steroids. I’ve also found that it helps keep my allergies in check. I’m not sure if its a benefit of the tea, hot water, or placebo effect. Either way, I’m grateful for a way to reign in the allergies that doesn’t involve a controlled substance. But how to drink tea (especially loose leaf tea) while traveling? More, how to travel well when doing so? Keep in mind that I buy my tea two pounds at a time to save on shipping which keeps my tea at 12 ¢ a cup. That’s a 3 month supply, btw. Tea Bags (53¢, which is good, but expensive and defeats the purpose of ordering loose). Bags your own (17¢ total cost, more reasonable). Bring a tea ball (Basically puts the cost at the base 12¢ price). While any of the methods work, they aren’t exactly what I would call elegant or compact. Having somewhere to store a tea ball can be difficult and they don’t like to dry. Other methods (ahem, tea bags) are good for a single cup and you’re left wanting more. Its nothing for me to drink 6 cups or more on a day off, so ordering individual tea bags is right out (even double brewing that’s an extra $1.23 a day). No name tin from amazon. 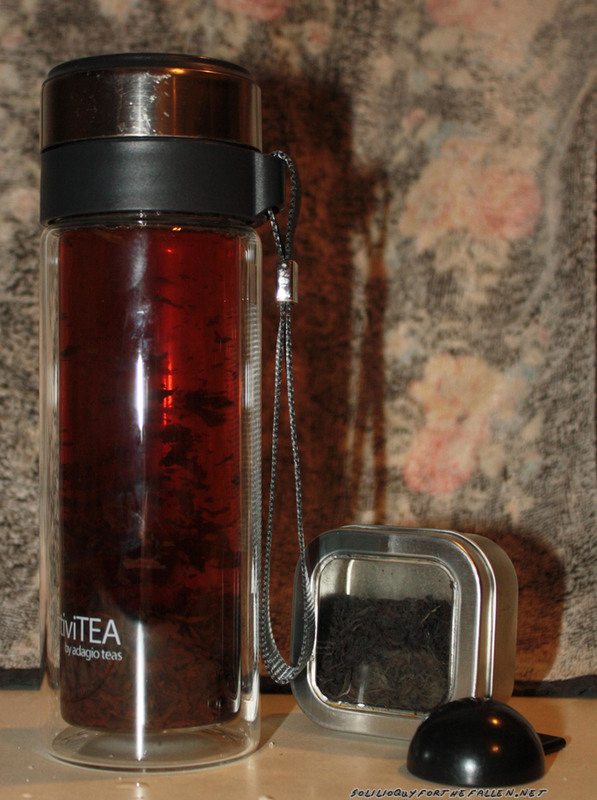 It holds 4-6 teaspoons of tea. A teaspoon trimmed to fit inside of the the tin. For longer travels, a secondary tin is useful. This was the method I used on my South-Eastern tour last summer. When the square tin ran out, time for a refill. There are two ways to brew with the activiTea. The first, and Adagio approved, is to put the leaves in the top cap above the strainer, and lay the activiTea sideways to brew (they say upside down but I’ve found that sideways works better). The second, and my method, is to put the leaves in the bottom of the glass mug, add hot water, and then screw the cap and strainer on. When you’re ready for a cuppa, you get out the tin, and scoop a teaspoon into the activiTea via either of the above methods. Drink as you’re ready. Adaigo’s Ceylon Sonata Of course. English Breakfast on steroids. Strong and dark. Adaigo’s Lapsang Suchong. Not for the faint of heart. Brew carefully, and enjoy the smokey taste. Regarded as a lesser cuppa in China they’re happy to sell it to “foolish” westerners. Foolish or not, my cup of choice for thinking. Adaigo’s Forest Berries. A fruity blend for the fruits out there. I like this on occasion with honey. A definite change from the above cups.